Informal housing, be it in the barrio, tugurio, favela, bidonville, gecekondu or kampung, supports the majority of rapidly urbanizing populations in cities of the global South. Yet, many city planners and housing policymakers still regard such urban vernaculars primarily as evidence of backwardness, social malaise, economic involution and planning failure. When lumped together as “slums”, they are seen as a threat to the wider project of sustainable and resilient city development – a problem that must be overcome. Viable alternatives remain thin on the ground. Most current options lie in the fairly narrow space between mass public housing, relying on industrial modes of production and centralized delivery and management systems, on one hand; and laissez-faire, often low-density and land-hungry suburban models, on the other. In the context of rapid urbanization, mass housing models tend to be too expensive to meet soaring demand, while the private sector only meets demand by cutting corners – on space planning, transport integration, water, energy and waste management – that they accelerate many of the worst effects of urbanization. This includes destroying productive land, traffic congestion, and water and air pollution. Given this impasse, the obvious point is increasingly hard to ignore: informal housing is not always a problem to be solved, but can be treasure-trove of city solutions. In other words, we must take the time and energy to learn from the kampung, and the barrio, and the gecekondu, and so on. This involves learning to see past the spatial irregularity, the surface grime and the patchy aesthetic to understand the economic resilience, the social cohesion, the autonomy, the technological ingenuity, the remarkable skills of everyday living that can flourish in informal quarters of cities of the global South. 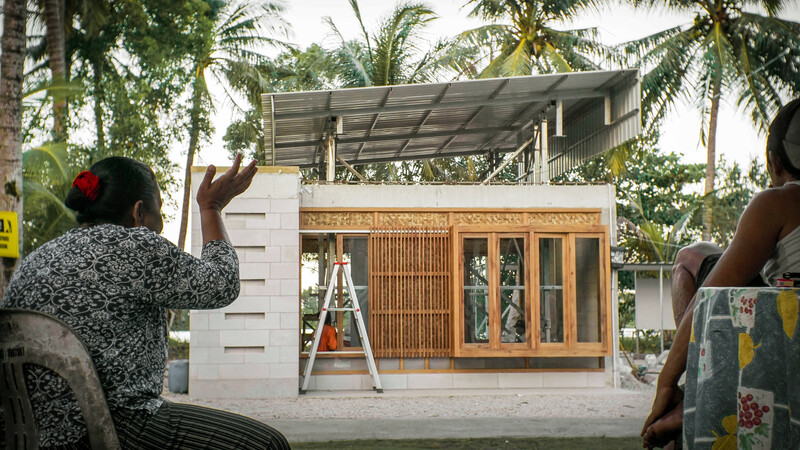 A new design project called “the expandable house” (rumah tambah in Bahasa Indonesian, or rubah for short) tries to do just that – learn from the kampung. It identifies and builds upon the successes of the kampung and other forms of informal housing, and tries to improve upon their weaknesses. In so doing, it addresses the minimum criteria that the UN Habitat defines for adequate housing, such as security of tenure, availability of services and infrastructure, affordability, habitability (ensuring physical safety), access to jobs and facilities, and is capable of expressing cultural identity. Kampungs often exhibit precisely these features already in their strong culture of self-reliance, economic resilience and a robust sense of community. They can be, but are not always, dense. But too many still do not have good water, energy nor waste management systems. And many are structurally unstable, have fragile tenure rights, and do not provide especially adequate public space. The expandable house project is part of ongoing research by the Urban-Rural Systems (URS) team at the Future Cities Laboratory (FCL) (a research unit of the ETH Zürich in Singapore). It learns from the kampung by allowing the house to be flexibly configured around fluctuating patterns of resource consumption and expenditure of its residents. Practically, this means understanding the patterns of household income generation and expenditure, water, energy and food consumption, as well as waste production. As this metabolism is usually uneven and often precarious, it is important that the design can be a dwelling and an income-generating unit that manages its own waste, water and energy locally.